Caves are holes in rocks, The rock in question is generally limestone, but how and why do they form? This page describes the geology of caving areas, especially our British caving and to some extent mining regions (and some foreign places as well). How that geology has been shaped to give us those landscapes and how the geological and physical landscapes shape the types of caves and the potential for caves in each region. At a number of places in these descriptions you will find a number of Geological terms used. I have hyperlinked key words to further sources of reading that you may find interesting or useful. If you are not familiar with some of the concepts involved I would recommend these resources for your edification. This has (unfortunately in many ways) been revised significantly in the last few years as a much greater mastery of British and International stratigraphy has allowed international and intercontinental correlations and new type sections have been agreed. This means that some of the standard British terms for ages of rocks are not now used in the more modern texts. 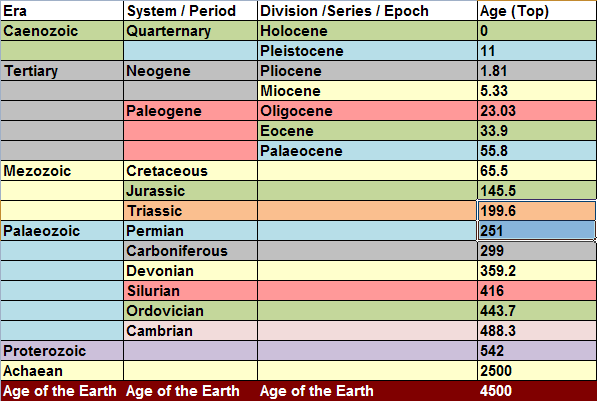 If you do want the detail, rather than repeat and have to update a constantly shifting set of names I provide a link to the Standard British Geological Survey Timescale . Here you can browse through the various ages and see the latest terminology. Rocks that are of speleological interest in Britain are mainly limestone as described below, but include some of the rocks that have been mined. These include a number of Sandstones that have been either quarried for building stone or use in other industrial processes. 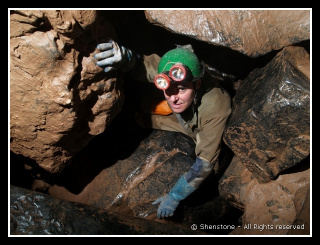 Examples of these that are accessible to cavers are the Dinas Silica Mines South Wales, the Box Stone Mines near Mendip, and the Alderly edge Copper Mines in Cheshire. Limestone is dissolved by slightly acidic water as well as by the normal processes of physical erosion (i.e. the scraping away by the abrasion of harder minerals such as sand grains when washed against it). This means that even slowly moving water passing through the rock can enlarge any existing weaknesses and turn them into caves. Dolomite is Calcium Magnesium Carbonate (CaMg(Co3)2) the additional Magnesium makes it a slightly heavier and harder mineral and one that is less soluble in acids. Therefore caves in Dolomite tend to be smaller. Marble is a term that is used for either of these rocks when it has been recrystallized by heat and pressure. There are other rocks that contain caves Dolomite and Marble are too types of rocks that are very closely related to Limestone and they will be described below. Other evaporate rocks such as gypsum and salt can have caves formed in the same way, but these rocks are very soluble and you need a much drier climate than the UK for them to be usual at the surface and have caves formed in the same way. There are many factors that effect the cave that will be formed. The specific nature of the Limestone, the amount of water passing through, how acid the water is and how much sediment it's carrying, the dip of the rock and whether it's cut through by faults or has been folded. The following sections go through these in some more detail. One of the Key aspects that effects the way caves will be formed in limestone is the solubility of the rock. In fact calcite is not much more soluble than Quarts, it requires a chemical reaction to change it into a soluble form. Solubility is therefore a chemical reaction with the Calcium Carbonate (CaCO3) being dissolved in a number of acids based on dissolved Carbon Dioxide Calcium Carbonate (CO2). The reaction has in fact made calcite more than 5 times more soluble than the original calcite. Some limestones are very porous and the water can flow easily through these pores. However such rocks are usually very soft and don't form very good caves as they collapse so easily. An example of this in the UK is the Cretaceous age rock, the Chalk of South and Eastern England which is very porous. The lack of such porosity is however no limiter to cave formation. The most popular cavernous rock in Britain is the Carboniferous limestone. This is a poorly porous rock, very hard and crystalline but it has many bedding planes and has been fractured by many joints as you can see in the picture which allow the water to flow through the rock and therefore the dissolution takes place. A limestone can also be made harder because of chemical impurities. As described above, a good example of this is caves that are formed in limestones that have a high proportion of Dolomite, Calcium Magnesium Carbonate (CaMg(Co3)2). This is often seen where there is a partially dolomitized limestone and you get some beds with more dolomite and some with more calcite. In these occasions there is often a clear difference with smaller passages in the dolomite and large in the calcite In South East Wales there are dolomitic layers in the sequence and the passages in these layers tend to be smaller and sharper. The thickness of limestone has a major effect on the type of caves that are formed. Thin limestones that are inter-bedded with other rocks such as shales may be totally or partially sealed from having water flow into them. This will prevent cave formation if there is a lot of the other rock, or if the water has managed to enter the limestone, it can give rise to a level passage at a water table. It is also not easy for long pitches to be formed where there are thin limestone layers with non-soluble layers between. Caves can form in any limestone, but deep vertical caves will only be formed where there is sufficient depth of limestone for them to be formed in. In the UK there are different depths of limestones in the different regions with Yorkshire having the greatest vertical depths of rock and therefore not unsurprisingly the greatest concentration of deep vertical caves. However because caves are not just vertical it is actually in South Wales where the greatest depth within a UK cave 308m is found in South Wales. It is Ogof Ffynnon Ddu. OFD has caves right through the limestone beds from the topmost in the upper areas of the cave right down to the lower layers just above the Old Red Sandstone that is below the cave. It is not a steeply vertical cave the depth is because of a relatively gently downward slope over a long horizontal range. Very deep sections of limestone can be found in mountainous regions such as the Pyrenees in Spain and the Vercors area of France that contains the Gouffre Berger. Reefs are areas of limestone that were once algal and/or coral reefs, just like the Great barrier reef today. These tend to be thicker, unbedded areas of limestone that may have different properties to the limestone around them. The fore reed (ocean side) will tend to be thinner bedded with fragments of corals etc. that have been broken off and washed down, whereas the back reef (sheltered between reef and coast) will often be very thinly bedded or have layers of sediment in it depending on whether river input was close or not. They can either be areas that are good for cave development or areas with poor cave development depending on the surrounding limestone and their physical properties The classic area for reef limestones in the UK is Derbyshire where the Castleton Reef limestones contain some of the regions best and most visited caves. At places where a thicker layer of limestone is found beneath a layer of non permeable rock (a rock that does not allow water though), entrances are commonly found because the run-off has been concentrated into one place by the streams instead of seeping in over a wider area. One of the most classic examples of this sort of cave development is Kingsdale in Yorkshire where Simpsons', Swinsto & Yordas caves are found where the water flows off the Yoredale rocks onto the limestone. In all of these caves the water has cut down through the Limestone aggressively and in that way creating the classic SRT through trips that are enjoyed by so many of us. All of the British limestones have been folded and uplifted from where they were formed at the bottom of warm tropical seas. The different caving regions have been subjected to different degrees of folding with the South Wales region being formed out of one large synclinal basin, and Derbyshire being a large anticlinorium (an anticline with smaller folds on the sides of it) they therefore have different dips and this has a major effect on the caves of each region as will be described in more detail in the regional descriptions below. Folding also gives rise to joining where the relatively brittle limestone is cracked without movement (compare with faulting below). This is show in the blue limestone layers in the diagrams. Jointing usually occurs in 90 degree grid patterns when viewed from above. These can easily be seen on limestone pavements which are flat beds of limestone which have been scraped clean by ice and then weathered to the point where you can see the join patterns easily. 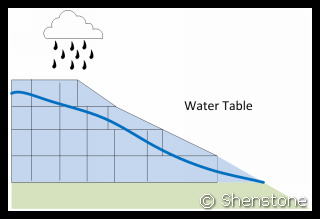 Water will tend to flow either along a horizontal plane (at or below the water table) or will try and descend to a lower level (either above or below the water table). The limestones of the Yorkshire Dales are almost horizontally flat, with almost no folding visible in large areas of limestone. Combined with their thickness this leads to water flowing along the bedding until it can find a way down and therefore a series of horizontal and vertical passages are formed. Around the "North Crop" of the South Wales region the limestones have been folded to a moderate extent. This combined with the way that valleys have been formed that often mean that water has some distance to flow before it can resurge. The result is systems that gently work their way down a vertical height, without having to form vertical pots. There are 2 types of faults and both are seen in caves. The type of fault that occurs when rocks are under tension is called a Normal Fault and that caused when rocks are under compression is called a reverse fault. 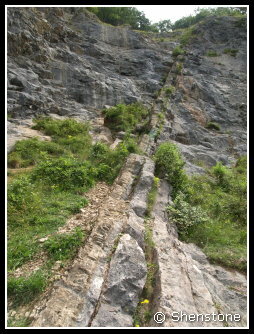 Faults are lines of fracturing that cut through layers of limestone, just as they cut through any other rock. They may bring a layer of impervious rock against a layer that allows water through and this may have a major affect on cave development. In South wales there is a pervasive NNW - SSE faulting pattern, and this is reflected in the orientations of the passages in such caves as Agen Allwedd, Daren Cilau, Craig y Ffynnon and is probably most clearly seen in Ogof Draenen where the fault line that forms the main stream passage has been such a strong feature that it has captured all of the water and to present there is no cave significant discovery to the West of the fault line in any area other then the highest parts of the cave. Some of these faults in South Wales have almost no movement from one side to the other, and some have movements of many meters. Areas where hot water has been passing through the rock Fault lines (such as Derbyshire) often have other minerals deposited into them, these are called veins. These minerals include such things as galena ,lead ore, and are often sought after as they are economically valuable. These are useful to the caver as the mining of these minerals creates interesting passages that can be visited, and these passages often intercept caves that cannot be seen at the surface. Where water goes into the ground it will try and descend as fast as possible. 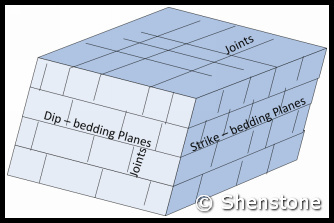 To do this it makes use of the joints and faults described above and if the bedding is sloping it will use this as well. 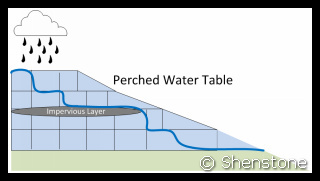 Once it reaches an impervious layer it will not be able to descend as fast and it will run along that layer until it reaches a surface outcropping where it will form a spring. This is the classic model and is a simple model that only really applies in very straightforward valleys. What happens in many places is that the water table influences flow in other ways. 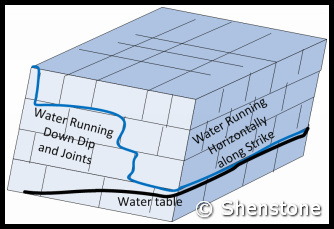 The Water can flow horizontally along strike in a section of rock that is filled with water towards the lowest point where the water can escape. This can be some distance away and examples of long main river passages that run for many miles are known. The escape point can be in a different valley all together such as in Ogof Draenen South Wales where the risings are 6 miles south of the entrance. The hydrology of this cave is very interesting because it shows that the water table was once much higher and flowed to a northern valley whereas it now flows a much further distance to a southern valley. This is considered to be a case of water capture when the southern valley was deepened (probably in the Ice Age) and the sudden change from northerly flow to southerly flow can be seen in the cave with a dramatic change in roof line at the capture point at the junction of main stream passage and Gilwern passage. As described above water will flow down until it hit's the water table or an impervious layer. 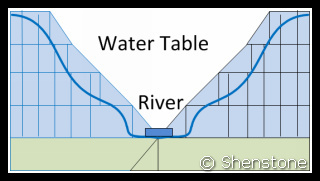 If there is an impervious layer of some sort that is not widespread through the rock then a feature called a Perched Water Table can be formed. This is a part of the rock where the water table is above an otherwise bottom position within the strata. it can be just above the impervious layer as shown or if the input is sufficient it can be higher again. 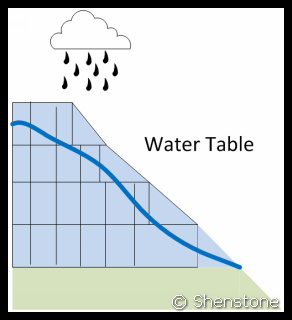 Water will flow out of the rock if the ground is very steep which will mean that the shape of the water table will be very steep as well. Not strictly topography, but influenced by it is the concept of water mixing. 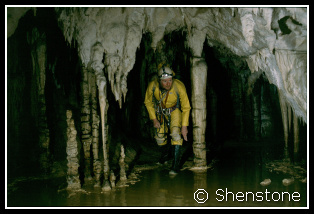 One of the most sought after features in cave exploration is a pitch or vertical shaft. These can be formed in either the vadose or the phreatic zone, and can in fact be formed by water moving upwards or downwards when they are in the latter Phreatic zone. Another mode of cave passage formation was identified in the late 1960's and is becoming increasingly widely recognized. 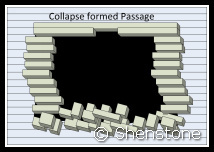 This is called Paragenesis and it can only take place in the phreatic zone because the mode of formation is for the floor of the passage to get covered with a layer of sediment which stops it being eroded and then the cave to develop upwards from that impervious layer. For this to happen there must be enough water flow for acidic waters to erode the roof or walls, but not so much water flow that the protective sediment layer is removed. 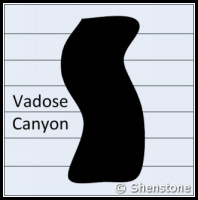 If the layer of sediment stays intact this can lead to very large canyons that look at first the same as vadose canyons, but with very close inspection the migration of any curves in the passage wall will be upwards instead of downwards. 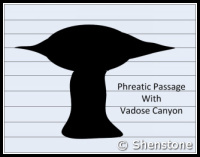 Another feature of paragenetic passages are notching. Notching will occur where the water is flowing in such a way that sideways weaknesses are exploited, rather than the roof of the passage or maybe of the passage was not filled with water. A passage can have one or more sections above the floor that are widened giving shelves of rock between the notches. One of the best examples of notching in the UK is to be found in Megadrive in Ogof Draenen. Where a passage is in rocks that do not have significant inherent strength, such as a thin bedded rock where there are softer muddier layers between the harder pure lime layers, the roof of any passage that is formed will be weak and may collapse. If the material that is on the floor continues to be eroded, this can occur in a repeated fashion so that the passage becomes larger and squared off rather than the rounded features described above These passages become very squared off in some cases such that they almost look man made. To describe cave deposits and formations some understanding of the terminology is needed. Deposits are primarily anything that has been brought into the cave since it formed; mud, sand, stalactites and stalagmites are all cave deposits. The shaped deposits that are found in caves such as stalactites, stalagmites, columns, curtains and helictites are given the name formations. 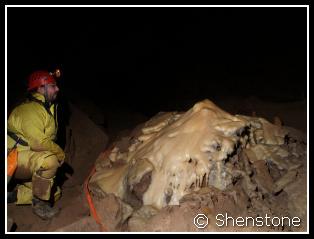 Similar shaped formations are normally created by similar processes regardless of the materials involved; e.g.. both mud and calcite stalactites are formed by dripping water. The term speleothem is reserved for formations that have been laid down in a cave from water and are typically crystalline formations with banding only. 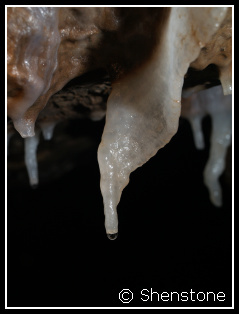 Mud formations are not usually included in the term speleothems: meaning a calcite stalactite is a speleothem, but a mud stalactite is not. Calcite speleothems outnumber those of other minerals by a very large amount. The main reason that we have calcite speleothems is that the reaction that dissolved the limestone has become reversed. This occurs because the cave environment has a lower level of CO2 than that in the rock and can come out of the carbonate solution. 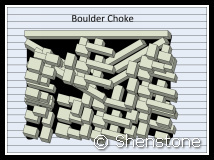 Stalactites are formations which hang from passage roofs, wall projections and undercuts. They form many of the most spectacular formations in all caves. They occur when the speed of water being delivered into the straw is enough for it to grow, but not too fast that the water is just washing the dissolved calcite away. In fact they will also not form when the incoming water is moving too slowly as, in that condition the central canal blocks up with crystals, and the water flows down the outside and create a a massive stalactite as described below. Straw stalactites are interlocking crystals which can be seen in close up macro pictures of the ends of them. Some straws, of which there are good examples in Travertine Passage Ogof Craig a Fynnon (picture on the left), become blocked and the water percolates through the sides of the straw, depositing material on the outside, either as fine crystals or more massive layers. Massive stalactites are not always as large as the name might imply, such as the ones to the right which are only about a foot in length, but they can give some impressive displays. They may be formed by deposition on the exterior of a straw type deposit, but they also form where water runs over an edge and flowstone develops into pendant formations. Massive stalactites are often banded inside with growth layers where the amount of deposition has changed from season to season. In some places these layers act almost like tree rings with significant interruptions being visible in drought years. This gives an ability to correlate environmental information from cave to cave and is now an expending field of interest as we try and understand more of how climates change. Where water flows out into a large chamber or passage and into an environment with less CO2 you tend to get a lot of stalactites. The Hall of the Mountain King in Ogof Craig a Fynnon is a good example of this. They are often, but not always, formed below stalactites, indeed in some cases it can be hard to see where the corresponding stalactite is or the water that is forming the stalgamite is coming from. They are normally broader than their associated stalactite, but not always so as you can tell from the picture from Coventosa in Matienzo, Spain (below). They can be up to many meters (even 10's of meters) high, and are in the main formed from massively crystalline calcite. 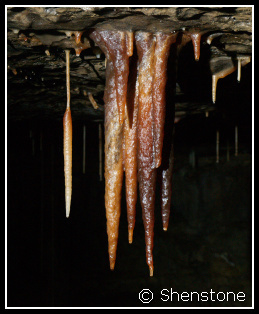 Just like stalactites they are often layered and can be used for environmental and dating purposes. 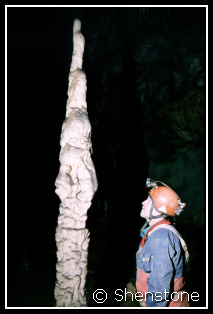 The rate of growth and the size of the stalagmite will depend on the amount of carbonate saturated water arriving at the floor of the cave and how it reacts when it gets there. This can be effected by things such as the ability of air to evaporate the water and the shape of the ground that is being deposited on. Columns are formations that reach from floor to ceiling, they are normally formed when a stalactite and stalagmite reach each other and coalesce. Columns are often an even thickness along their length with some thickening at the top and bottom. 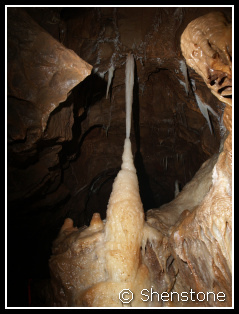 unless they are recently joined such as the ones to the left above in Shatter Cave, Mendip which are clearly a stalactite and stalagmite in the recent past, and a clear comparison to the one from Coventosa, Matienzo, Spain to the right which has clearly been joined for a more substantial time. Flowstone is formed when layers of minerals are deposited from water slowly flowing down cave walls, across a roof or along the passage floor. It is often rippled and coloured by mud and iron and is sometimes built into large 'bosses', which if they are over an edge will have stalactites dripping from them. Curtains are formed where water runs down a sloping roof or ledge and deposits a line of crystals. These are then developed in a downwards direction, often with bands of colour which are formed by the amount of any impurities varying from time to time. The typical curved and folded shape of curtain formations is often attributed to the curving path taken by the original water finding a route down the rock just as droplets take an erratic path when moving down a window. helictites are unusually shaped formations which grow from the passage walls or roof and heligmites are those which grow from the passage floor. Helictites have fine feeder channels for the water just like straw stalactites, but this is generally much finer such that there is not a water droplet, but the shape of the growth is more influenced by crystal directions which means they can develop in strange directions. 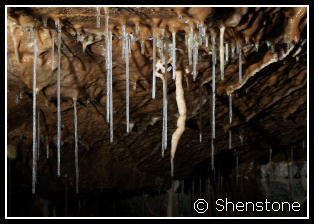 Helictites can develop into straws and more massive stalactites, and vice verse as the amount of water feeding the stalactite changes. Anthodites are radiating groups of crystals or needles which unlike helictites are radiating out from a central base. These may occur at the end of a straw, or directly radiating from a cave wall. They are usually aragonite, but Anthodites made from gypsum are known. Anthodite crystals are quite small 1mm -10mm which gives the formations a feathery appearance similar to the anthers of a flower which is where the name comes from. Some excellent examples that I had the pleasure of studying are to be found in Urchin Oxbow and surrounding areas in Ogof Daren Cilau, South Wales. These were the first Aragonite formations to be reported from a Welsh cave, and since their discovery and description Aragonite has become more widely recognized in many other caves in the area. Where lime rich waters abound there are the possibilities for splash formations, These form around the outside of waterfalls and splash pools and are often characterized by many small bulbous formations. In previous sections we explored the aspects of geology that give us the varied types of cave that we find in the British Isles. Often when we venture underground into these caves we pass strange marks on the cave walls. Many of these are fossils, a wide variety of which are found in the Limestones that we're caving in. Fossils are the remains of dead animals or plants or the tracks and traces caused by such. They are usually animals with hard outer shells rather than soft creatures such as jellyfish, and also vertebrates such as fish, but there are exceptions as you will read below. The chance of finding specific types of fossils depends on the type and age of the limestone. 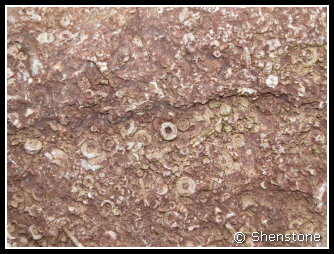 For example the Metamorphosed and very early limestones of the parts of Scotland like the Isle of Skye are not going to be as richly fossiliferous as the Carboniferous Limestone that we find in most of the rest of the UK caving regions, and even that varies with reef areas such as are found in Derbyshire being much richer than the shelf carbonates found in parts of Wales and Yorkshire. It is often difficult to make an exact identification of the fossils present in caves, as all that we see are cross sections where the fossils are cut through by the cave passage, sometimes at odd angles. What I hope to give here is an insight into the various main types of fossils and the habits and forms of the living creatures that these fossils once were. It is often difficult to make an exact identification of the fossils present in caves as all that we see are cross sections where the fossils are cut through by the cave passage, sometimes at odd angles. Some of the most common fossils seen in cave walls are crescent shapes of white calcite showing up in the darker limestone. These are usually the remains of a group of shells called Brachiopods. Two shelled creatures that spent most of their lives resting on the sea floor, supported by spines, or holding themselves down with a small fleshy foot called a pedicle. This pedicle stuck out of the shell through a small hole called a foramen. Brachiopods are marine, shelled invertebrates that look superficially very much like mussels (see bivalves below). They are actually quite different in their anatomy, and they are not closely related at all. 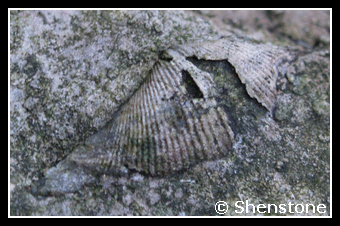 The two shells of brachiopods are of unequal size (inequalvalved). The valve that has the attachment for the pedicle called the pedicle valve and is usually the lower and somewhat larger valve. The other valve is called the brachial valve and holds the a feeding tentacles, the lophophore or brachia. 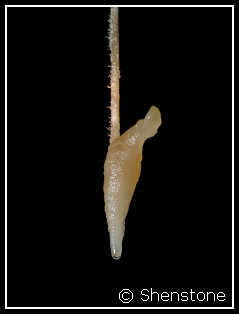 The brachidium is a long ribbon or loop-shaped calcified support for the lophophore which is attached to this shell. Sometimes the brachiopods are seen with both shells in place and the right way up, and other times they are seen broken up and washed into layers where there are many broken and / or stacked shells. These are called Life position and Death Assemblage respectively. Brachiopods are found in rocks of all Phanerozoic ages because as a group they have existed from the very beginning of the Cambrian radiation to the present day. However it is fair to sat that their peak time was in the Paleozoic with a small resurgence in the Jurassic where rhynconellids are quite common. The Brachiopods are now relatively insignificant. Most surviving brachiopods are mostly found in very cold parts of the Pacific Ocean, either in polar regions or at great depths. There are about seventy living genera and about 300 living species. Some of the most common brachiopods in the Carboniferous Limestone are the Productids (Example from near County Pot, Yorkshire left) which are strophomenids. Occasionally, and particularly common in Derbyshire. 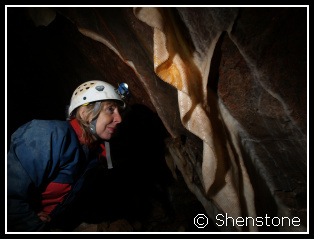 Very large specimens of the genus Gigantoproductus can be seen in roof in Carlswalk Cavern, Stony Middleton, Derbyshire. 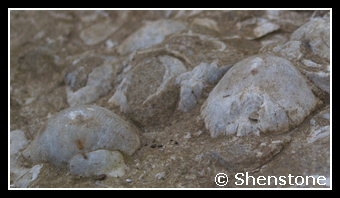 I have seen these misidentified on a number of caving websites as Oysters which are actually bivalves. They can reach up to 30cm across and are seen as sharp edged usually white curves in the dark limestone. The life position of the productid brachiopods is with the curved shell cupped upwards and a second more flattened shell above with the animal living in the space between, and the whole animal held in life position by a multitude of spines rather than the animal being held down by it's fleshy foot as described above. Another fossil that is at least as common in limestone as the brachiopods is the Crinoid or "sea lily". These fossils often go unnoticed because they are usually fragmented into unspectacular pieces. This is a shame as the complete animal is quite spectacular. Although the creature resembles a plant, even to its "roots", it is however an animal (an echinoderm or relative of the sea urchins and having the same five sided symmetry) which feeds by filtering its food from the water. The circular fragments that we usually find, once again often in layers, are from the stem or arms of the animal and are called ossicles. The stem leads from a hold fast attached to the ground (or possibly a floating object such as a log) or in sediments up to a cup shaped body (calyx). 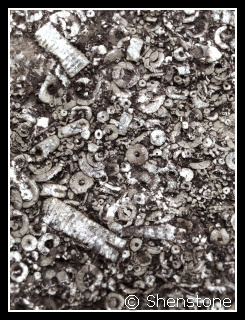 Some layers of limestone are made up almost entirely of Crinoid ossicles. A third group of fossils often seen in cave walls are the Corals. These are the predecessors of the animals which form the Great Barrier Reef and the reefs in the Bahamas. The Tabulate corals are all colonial and grow upwards as a colony secreting a new floor or tabula every so often for the active polyp to sit on. The limestones of Derbyshire are made up in many areas of reef knolls built up from algae and from the skeletons of these corals, but they can be seen in other caving areas as well, one particularly spectacular example being in the lower entrance to Dan-yr-Ogof, just beyond the climb to the cavers gate. About 20m further on there is a band of coral about a meter thick that extends for about 15m along the wall of the cave. Some rarer, but still occasionally seen fossils are the Gastropods. Although Gastropods that are cut through so you can see a clear spiral seem clearly identifiable, this is not always the case, as they can be confused with the Goniatites described below. Both have representatives that spiraled in the same way, and it is only the presence of chambers in the shell of the goniatites that enables then to be distinguished. The gastropod's shell however is not chambered and their soft parts occupy the whole shell. 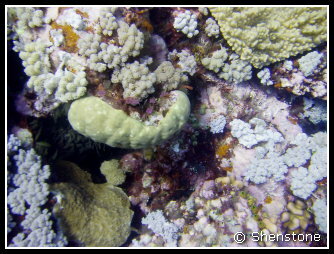 Some were grazers living on algae and other plant material whilst others active hunters of other marine creatures (well as active as a snail can get). Even more rarely identified are the Goniatites. Goniatites are related to modern Nautilus and squids, and also to the extinct ammonites, they have a shell made up of chambers with the animal living in the latest and largest, or "body" chamber. They were active swimmers and hunters, using the empty chambers for buoyancy. Like the Gastropods, those that are cut through so you can see the spiral have a chance of being clearly identifiable, but also like them, this is not always the case. Both have representatives that spiraled in the same way, and it is only the presence of chambers in the shell of the goniatites that enables then to be distinguished. However the thin walls of the chambers are not always well preserves and there's one in the right hand wall of the passage as you start up Salubrious Passage that I have always been unsure of. Bivalves are the most common group of 2 shelled seashells alive today. Thay are things such as mussels, clams and oysters. Both types of shapes are very common right through geological time and both forms can be found in the Carboniferous. Bryozoa are small collonial animals that are often mistaken for corals. The most common forms are as a thin mat of encrustation on the surface of another shell, rock or even a plant, and as small braching tubules that are self supporting. Bryozoa are another creature that is still in existance and they can be found encrusting seaweeds on many parts of the UK coast. Most of the Fossils mentioned so far were gentle bottom dwelling filter feeders, or at least hard shelled creatures. These are the most common, because it is these types of animals that are the most likely to become fossilized. However in some places the remains of more active and more aggressive creatures can be found. In Ogof Draenen for instance Shark teeth and fin supporting and defensive spines can be seen. These are so common and so spectacular that they can be used to identify the particular layer of limestone that they occur in and map it around the cave. Some of these fins from a fish called Ctenacanthus major are so large (about 3" across) that we can even see the holes where the blood vessels passed through the bone. A Mineral is defined in the text books as "a substance of fixed chemical composition and structure formed by the inorganic processes of nature." Normally each speleothem is made from only one mineral, but some are made up from more. Each mineral has a unique chemical composition and structure which means that it will have certain properties which can be used to identify it. To test these properties geologists use a number of methods which include scratching the mineral or treating it with acid. Cavers should learn to rely on appearance and try and avoid resorting to these tests. This page covers a number of minerals that are of interest to British Cavers, some being "Cave Minerals", and some being those found in British mine workings that are commonly visited by cavers. In addition there is some discussion of various "biominerals" being those mineral like substances formed by the biological processes of nature. Calcite is the commonest mineral found in caves, being the main mineral of Limestone. It is dissolved by mildly acidic waters, but re-precipitated to form the majority of stalagmites and stalagmites that decorate caves so wonderfully. Calcite can appear as white or colourless crystals when pure, but many speleothems are coloured by iron and mud into a range of red/brown colours and some such as the Blue Greenies behind Leonie Jayne's Playpens in Daren Cilau are coloured pale green by copper. Aragonite is a polymorph of calcium carbonate, that is they have the same chemical composition, but different crystal structures (i.e.. their atoms are arranged differently). The most stable form at cave temperatures and pressures is calcite and so there are many questions as to why aragonite should form at all. It is thought that the presence of manganese ions and the rate of evaporation have some effect. Galena is the primary lead ore that was sought in Derbyshire and elsewhere where Lead mining has taken place. It is an unmistakable heavy grey mineral that breaks with cubic habit and is shiny when fresh. This heavy mineral is not as heavy as galena, but then it's not metallic and shiny either. The best way of identifying barite is that it seems like "heavy calcite". This is not strictly correct in many scientific ways, but it's a good rule of thumb. Barite can be pinkish or white in colour and is not transparent. Clay mineralogy is a subject for the specialists. There are many varied clay minerals and you need specialist equipment to identify them. To the rest of us this remains a wonderfully slimy or heavy and sticky substance that we have to deal with on a routine basis. 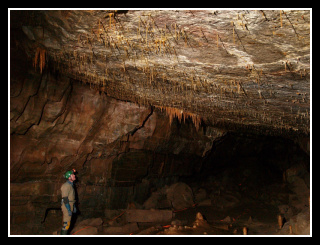 The south Wales caving region is the British caving region that has seen the largest amount of cave discoveries in the last 20 years. The 1960's to 1980's being the Llangattwg years with the discovery and exploration of Agen Allwedd, Ogof Craig a Fynnon, and Ogof Daren Cilau respectively and the 1990's being now the Draenen years. The South Wales caving region is bounded on it's inner edge by the South Wales Coalfield and on it's outer edges by a series of mainly Devonian aged rocks above which sits the basal conglomerate. It has been described as a bowl of limestone in which that coal sits. The bowl is not a regular shape though being a somewhat distorted oval shape as it has suffered somewhat over geological time, being cracked through by a series of faults that have often been eroded to give large valleys cutting into the interior. These Valleys allow a longer and deeper section through the limestones, and are the areas where a lot of cave exploration has focused. 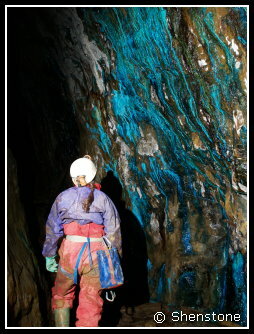 It is only in more recent years as extensive dye tracing work has been carried out that the water flows through some of the more inaccessible areas have been determined and now the caves that support these flows are being discovered. 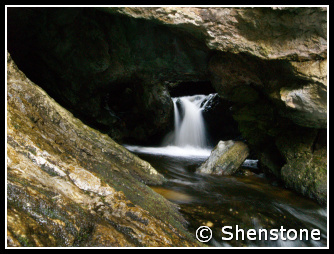 The Derbyshire caving region is a tale of water and heat as well as the limestone. Cracked through by a series of faults it has been flushed through by heated mineral rich waters that have left immense mineral deposits as the waters cooled and their ability to carry strange mineral salts was diminished. Derbyshire is an area where caves have been created, filled in again by these mineral rich waters leaving behind their deposits, and being rediscovered as the minerals were removed by "The Old Man". A number of Derbyshire caves have only been discovered because of the mining activity and conversely some of the old mines of the area have only been rediscovered because of the activities of modern cavers. Yorkshire is the largest UK Caving region and because of that it is also in many ways the most diverse. Carboniferous Limestone covers (or underlies) many square miles and so there is immense potential for cave development. The scenery of the Yorkshire dales is one that has been shaped by the rocks and by Ice. The amount of ice covering the area at times was immense. Even the famous Three Peaks which stuck out of the ice as probably harsh bare rock at times were sometimes covered. It is the former presence of these Ice sheets that gives us the spectacular areas of limestone pavement that dominate the landscape places like Chapel le Dale. The Yorkshire Dales are characterized by beds of almost horizontal rock. The main Cave bearing rock is the 200 m thick Great Scar Limestones overlain by shales and sandstones with thin limestones within. These layers above the Great Scar Limestone are the Yoredales, formed in shallower waters. The thin limestones of the Yoredales do contain some caves, e.g. Nettle Pot in Dentdale. but are most important because the boundary between these rocks and the thicker limestone below is the first chance that water has to sink rapidly through the limestone and is therefore the site where many of the caves start. 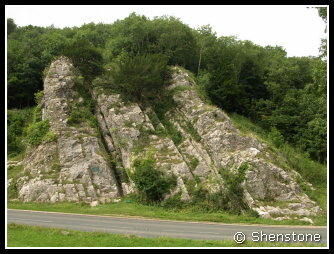 Mendip is a fairly complex piece of limestone geologically speaking. The rocks are more strongly folded than in other "major" caving regions. This gives the caves an unusual character of steeply dipping passages and deep sumps. County Clare has to be one of the most stunning places in the British Isles to go caving - even if you never go underground. The magnificent expanses of carboniferous limestone pavement and the friendly and warm reception that you get wherever you go means that this is a personal favorite for just a break. There is and unexpected and little visited area of speleological interest in the West Midlands can be found in the area of the Wrens Nest Nature Reserve. The Place to visit is the Mines that are in the Silurian (Wenlock) Limestone. The mines have been mined in pillar and Stall fashion, but are quite extensive. There is a significant depth to these systems in places, but the lower levels are flooded and are accessible only to divers. The site is a well-preserved Silurian coral reef with more than 700 types of fossil which have been discovered there. Probably the most famous (especially locally is Calymene blumenbachi, a trilobite nicknamed the Dudley Bug or Dudley Locust by 18th century quarrymen. For a geologist it is a wonderful place to visit as you can see a real reef ecosystem of corals, tabulate & Rugose, sponges, bryozoans, brachiopods, gastropods, bivalves, crinoids, criconarids, nautiloids, etc. When quarrying finished in the early 20Th century, the site was left with a substantial network of underground caverns many of which are now flooded to a considerable depth. The site was originally studied by the Sir Roderick Murchison, whose work in defining the Silurian System was mainly based on fossils and rock formations found at sites in Dudley. The Wren’s Nest is such an important paleontological site, that in 1956 it became a National Nature Reserve (NNR). Wren’s Nest was actually Britain’s first geological NNR. In October 2004, Wren’s Nest and Castle Hill were declared a Scheduled Ancient Monument in recognition of them having the best surviving remains of the limestone quarrying, mining and processing industry in Dudley. This includes the last remaining surface opening limestone cavern in the world – known as the Seven Sisters. There was a major roof collapse in October 2001, which, if left unchecked, could have resulted in the loss of the Seven Sisters so there have been programmes to look at stabilization work. They are also looking to increase the tourism capability of the site which is probably not good for wild caving, but if it preserves the site it's got to be worth it. 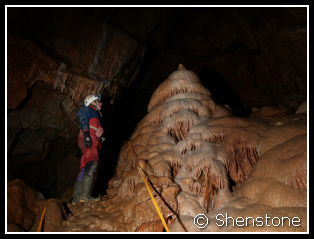 Devon has some interesting if small caves and some interesting mines. Some of the latter are to be found near the wonderful village of Beer in East Devon where the Beer Quarry caves complex is open to the public. Although the Yorkshire dales is the classic British caving region, there are caves also to be found on the moors and the East coast. North Wales has a number of Carboniferous limestone outcrops in the area around the Great Orme and continuing down past Ruthin and down to Oswestry. Classic sites include the Minerva Mine Complex and the Great Orme Mines themselves. There is a decent amount of limestone here (about 400m on the Great Orme), but it has been subjected to dolomitization and mineralization. The Great Orme mines are famous as copper mines, but also include some earlier emplacement of Lead and zinc minerals. The caves of Skye are small and sharp, having been formed in very old and marbleized Durness limestone. The limestones have been marbleized by the emplacement of the tertiary volcanics (the rocks of the Red and Black Cullins which were emplaced as molten rocks). They include dykes of igneous rocks in places (although I'm not sure if this has been seen in any caves).